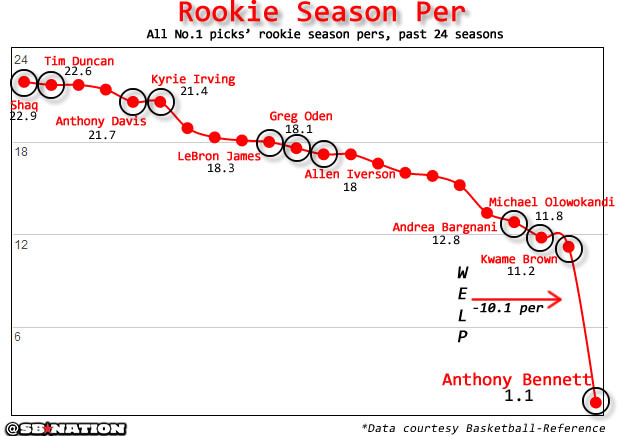 To say Anthony Bennett struggled during his rookie season in the NBA would be an understatement. To say 2013's first overall pick was truly awful in his rookie season would also be slightly below the mark. Bennett endured an historically awful first year in the pros with the Cleveland Cavaliers, becoming the first healthy no.1 pick to receive zero votes for the end of season Rookie of The Year award since the system was altered in 2003. His 4.1 ppg were also a low for a top pick since 1950 and don't even get us started on his PER rating. We know the Canadian endured some bad luck with injuries but it really was a poor year for the hyped talent. But now Bennett, who switched from the Cavs to the Minnesota Timberwolves as part of the Kevin Love trade during the offseason, has revealed what he believes was a key reason for his poor year. Speaking to Chris Mannix of Sports Illustrated, Bennett used a white board to help him explain that his poor vision was a major debilitating factor in the NBA - claiming that until this summer he couldn't see things in detail that stood no further than 10 feet away. "Anything far, I couldn't really see," he explained. "I couldn't see the people in the stands. Now I can see the scoreboard. I can see what plays coach wants to run." Being able to see play designs and calls from the sidelines is clearly beneficial, but until Bennett underwent Laser Eye surgery this summer he was effectively playing blind in terms of what he could see on the court. But why couldn't he just wear contact lenses like any normal, non-NBA playing individual with impaired vision? Well according to Mannix the youngster couldn't put them in. "Now I can see the scoreboard. I can see what plays coach wants to run." Having lost around 20 pounds since last season and solved his eye sight issues Bennett has a slightly better stat line in the early stage of this his second season in the NBA. So far he has averaged 6.2 points and is shooting 57-percent through the Timberwolves first six games.